The cover for this month's issue is Shoptalk host Ria Tanjuatco-Trillo who shares how she balances being a wife, her job plus being a mom to 3 (with 1 more on the way) kids. The issue is perfect for new moms with articles on preparing for maternity leave, dividing time between several kids, helping dad bond with baby, what to expect the first 6 weeks, top baby finds and tips plus more! I also found the articles on what you can do about school bullies especially helpful since my daughter goes to a traditional big school - with 32 kids in 1 section and a batch size of 10 sections. 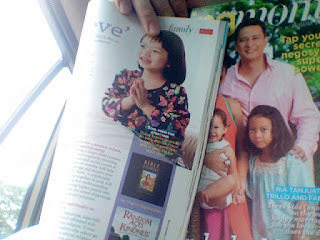 The magazine also thoroughly covers Marikina City - a place so nearby yet we as a family haven't fully explored. This is one section I will be referring to during the next long weekend. There's still time before August ends so don't forget to grab your copy and indulge my stage mom and wife moment!